I have to make a really big confession, again! Yes, again! I have never ordered anything (my iPhone case does not count) online. The thing is, I really love clothes, everything I buy must be really special and made with love. I want to touch clothes before purchasing them, the fabrics must be perfect and also the stitches are very important. I even smell everything. I know, I'm a really weird person. My body doesn't reminiscent the model's bodies and because of that, it is important for me to try everything because it fits me differently and my philosophy is to buy clothes that fit me perfectly. I don't want to have a bunch of stuff in my closet that I don't like or doesn't fit me. We are in the 2017 and maybe it is time to order something online, right? I consider myself as a modern girl and modern girls order products online, right? Are you with me? I think everyone needs a little black dress. That’s what I’ve always been hearing but I never had one myself (except one knitted version). The Little Black Dress has a lot of history dating back to the early 1900’s when black was most often worn for mourning. In 1926 Coco Chanel published her little black dress design in American Vogue, effectively making it an iconic addition to every woman’s wardrobe. It was about time I added one to mine. On Zaful I choose two black dresses, one lace skater dress and the other one is a black mini dress. I think I need two. I chose this lace skater dress in particular, because of the nice detail on the top part and simple and feminine skirt shape. The best part? It can be worn in so many ways. I can't wait to style it with the pieces I already own. And the second number is embroidered long-sleeved mini. 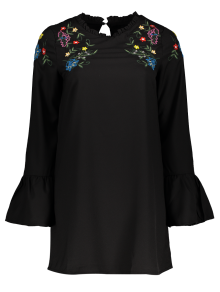 Beautiful flower pattern at the neckline substitutes accessories but combined with casual jeans it can be turned into an everyday outfit. Stay tuned and wait how I will wear this two dresses. Do you also need some new dresses? Something else? Now it is a good chance because Zaful has Easter special sale.